Car 'cloners' target prestige cars | What Car? Car thieves are targeting prestige cars then changing their identities to sell them to unsuspecting buyers. 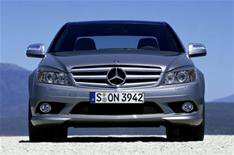 The Mercedes C-Class is the most popular model with criminals, according to vehicle history check provider, HPI. One in 10 cloned vehicles it uncovers is a Mercedes C-Class. Other upmarket models in its top-10 include the Audi A4, the Audi TT and the BMW 3 Series. To disguise the fact that the cars have been stolen thieves 'clone' them the car crime equivalent of identity theft. The number plates and VIN (Vehicle Identification Number) are replaced with those from a similar vehicle of the same make and model. • Be vary wary of a car which is offered for much less than it's true market value. • Even if it does, be cautious if there are signs that the VIN plate has been tampered with. A history check may not reveal if a vehicle has been cloned. However, HPI's guarantee offers up to 30,000 back if a car which has been checked turns out to have been cloned.